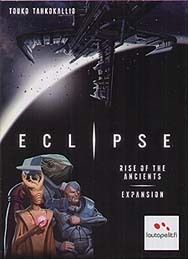 The expansion introduces several new additions to the base game, such as Rare Technologies, Developments, Alliances, Ancient Homeworlds and Warp Portals. There are also three new player boards with four new different alien species to choose from. New components allow up to nine players in one session. The Ancients are rising. Will your civilizations rise to the occasion and emerge victorious?